Mix all of the ingredients together and then form into 2 inch meatballs. Set aside. Sauté onions and garlic until tender. Place sautéed mixture in a large pot that can go into the oven. Add all of the remaining ingredients except for the spinach and bring to a boil on top of the stove. Turn the stove off and gently place the meatballs in the stew and gently pressing them under the liquid. Place a lid on the post and place in preheated 350 degree oven for 45 minutes. 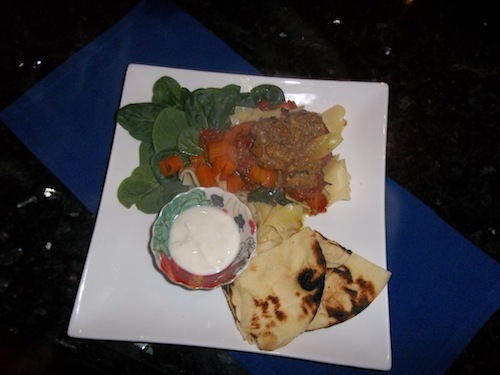 Take tagine out of the oven and gently stir the fresh spinach into the stew. Place lid back on pot and let it sit for 10 minutes. Prepare ingredients as directed and mix all together in small bowl. Serve Tagine with couscous/noodles or rice. Serve with yogurt sauce and toasted flat bread. YUMMMMMMEEEEEEEEEEEE! Moroccans eat flat bread at every meal? Morocco produces all of the food they need to feed its people? Lamb and seafood are the protein staples in their diet? Moroccan cooking involves a lot of spices like saffron/cumin/coriander/cinnamon/ginger and ground red pepper? Households make their own bread…and after it is shaped…they make their family mark on it and then their children take it to local bakery ovens to cook the bread? Their flatbread is made with Semolina flour and they do not use any shortening or milk in their bread? The national dish is Tagine? When attending your next Moroccan meal-it is only proper to eat and drink from your right hand! What happens if you are left handed???? Anyway…thanks for reading…see you next month!